In a medium bowl, whisk the flour with the coconut, baking soda and salt. In a standing electric mixer fitted with a paddle, or using a hand mixer in a large bowl, beat the butter with the sugar at medium speed until light and fluffy, about 3 minutes. Beat in the egg yolk and vanilla, scraping the sides and bottom of the bowl. Beat in the dry ingredients at low speed. Cover and refrigerate for 15 minutes. Roll the dough into 2.5cm (1in) balls, place onto prepared sheets 5cm (2in) apart and bake for 14 minutes. 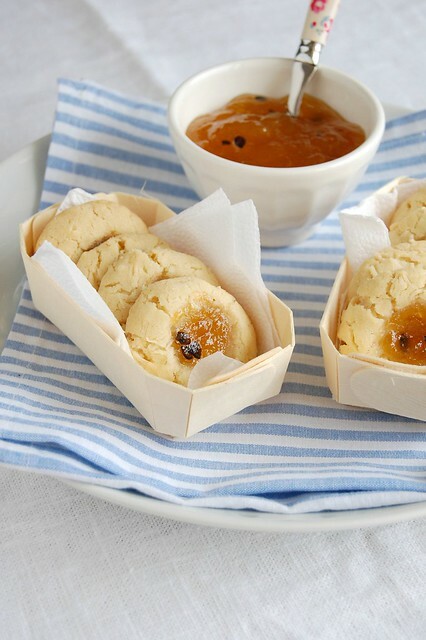 Make a dent in the cookies; fill with jam and bake for about 10 minutes or until golden around the edges. Let the cookies cool on the sheets for 5 minutes, then transfer to racks to cool completely. I love thumbprints, these are so pretty and the flavors are perfect! Passion fruit is my absolute favorite flavor!! These cookies sound wonderful! Patricia, this recipe goes perfect for me. We are in summer and coconut and passion fruit are so present during this season. I will try.